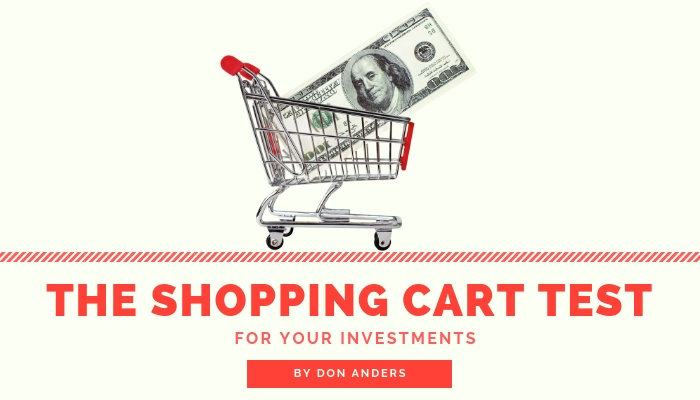 Have you done the Shopping Cart Test with your Investments? Most of the people that we meet with have not, mainly because they don’t know The Shopping Cart test is. So what is it?Well let’s picture you go to the grocery store and you pick out a carton of eggs and put it in your shopping cart. Do you know approximately (within a dollar degree) how much you should be paying for eggs? Most people do. Do you know approximately how much you should be paying for milk? Do you know approximately how much you should be paying for butter or any other staple? Yes, of course, you do. But do you know how much that you’re actually paying for your investments? And you might say, “Yeah, I’m pretty sure”. Great, well my recommendation is, do the shopping cart test. If you want to come in then we can take your investments, we can scan them in, and see exactly what you’re paying down to the dollar. And usually what we find is these fees are anywhere from two to five times more than what a lot of people are paying. We have had people come who say, “Yeah, I have no fees at all” and they’re paying almost 4% in fees. We’ve seen other people who come in and say “Yeah I think I’m paying about 1.5% and they’re only paying 0.5%, which is a great scenario. But if you don’t know, please let us do the Shopping Cart Test. Bring it in, we’ll take a look at the fees, we’ll scan it, and then at least you know exactly what you’re paying. Because when you go to a grocery store you’d probably be worried if, let’s say a carton of eggs cost $20. Would you have an issue with that? Of course, you would. If a gallon of milk cost $30, would you have an issue with that? Yes. Well what if your investments are costing you up to two, three, four, or even $5,000 more than what you think you should be paying every year? Come in, do The Shopping Cart test. We would love to take a look at that for you and, if nothing else, you’ll know exactly what you’re paying on your investments.